The overburdened Kenyans have a reason to smile after the Energy Regulatory Commission announced a sharp drop in fuel prices beginning midnight. 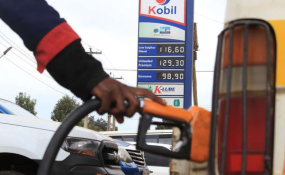 The price of super petrol will drop by Sh9.33, diesel by Sh10.04 and kerosene by Sh3.52 a litre. ERC attributed the huge drop to the average landed cost of imported petrol that reduced by 14.87 per cent, diesel by 14.71 and kerosene by 8.62 per cent. "The prices are inclusive of the Value Added Tax at 8 per cent in line with the provisions of the Finance Act 2018," said ERC. This means that in Nairobi, a litre of super petrol will retail at Sh104.21, diesel Sh102.24 and kerosene Sh101.7 for the next one month. In Mombasa, a litre of petrol will sell at Sh101.6, diesel Sh99.63 and kerosene Sh99.09. In Kisumu, a litre of petrol will retail at Sh105.73, diesel Sh103.94 and Sh103.4. ERC will review the fuel prices next on February 14.